To be a star yourself, you need extra star shine in your jewelry! Crafting a pair of supersize star shape earrings is easy with Imagine Sheet Metal and the Starstruck foiled paper from Rinea. The Sheet Metal star frames that are created with dies, keep inside the double-sided foiled paper that shows on both sides of the earrings with no extra work. Tear It Tape is a great tool to attach the metal pieces and the paper together. A liquid glue that may leak on in the center. To gift the star shape earrings, create a small pocket with more Rinea foil paper and a small sentiment stamped with VersaFine Clair ink. See how I did it! Die cut four star-shaped frames from Imagine’s Sheet Metal using a 2.5-inch and a 1.75-inch star dies. Die cut 2 Rinea foil paper stars using a 2-inch wide star frame. Place Tear It Tape around the Sheet Metal star frame on the back side of it. Set the Rinea foil paper star. It will leave space around it so you can easily glue the second-star frame. Punch a small hole and add a large jump ring and an earring hook. Repeat on the second earring. Score a 5×5 piece of cardstock at the lower 2-inch mark, place Tear It Tape on the short sides and fold to make a pocket. Cut a 1×5 inch piece of Rinea foil, place Tear It Tape and glue on the folded side. Punch two hole on the main card, leaving 1 ½ in from each side. Stamp the “Wish” sentiment stamp with VersaFine Clair Purple Delight ink and cut along. Set a star of Sheet Metal that previously removed to make the frame and the “Wish” stamped paper cutting on the front of the card using Tear It Tape. I enjoy drinking tea. There is something so zen about it. The enjoyment does not have to end after tea time. Keep the tea bags to make art. You can paint and stamp on them, sew into them, and even create sculptural projects, such as these little dresses. These dresses can be used on cards, art projects, place in a shadowbox, which makes for a great home décor for young girl/lady’s bedroom or simply make for yourself. Begin by allowing your tea bags to fully dry. I placed my tea bags on a ceramic plate with a paper towel and allowed them to dry for several days. The color of your tea bag will be determined by the type of tea you use. On this project, I started with a light color tea bag because it is Ginger tea. The tea bags are very delicate so a soft touch will be required to take them apart. Remove the tag by pulling it off. Remove the tiny staple with your nails. Rip open the seams. Take out the dried leaves by sloughing it off. Tear off the seams, otherwise, you’ll see it in your art. Do so, by tearing off the edges on the long side of the rectangle. The dresses will be made by using two dress patterns and gluing them at the seam, kind of like how real dresses are made. We will create one big sheet made of individual tea bags. This will be our “fabric”. One side of the tea bags will be rough, that’s where the tea leaves reside. 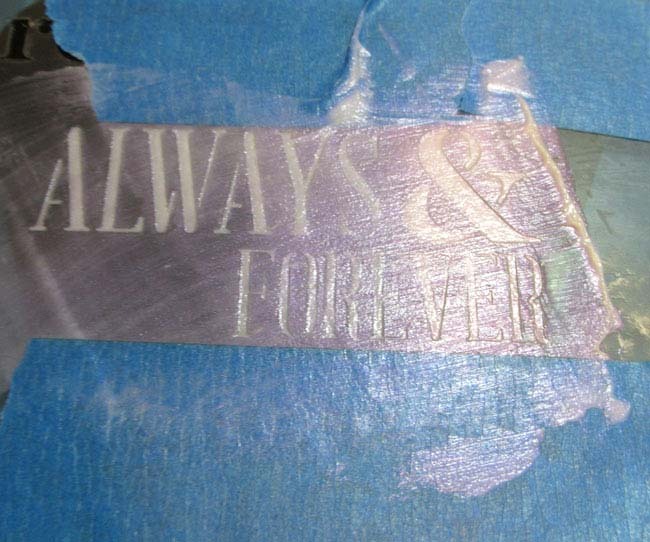 The sheet will have one smooth side, this side is ideal for stamping. Lay the tea bags, rough side up, on a nonstick surface; wax paper or Freezer paper. Please note, in order to get one smooth side, Freezer or wax papers work the best. Brush on Creative medium and adhere the bags together by slightly overlapping them. Make a sheet of tea bags to the desired size. Adhere the second layer of tea bags in the exact location as the first layer. Ensure that your sheet is big enough to make two dress patterns per dress. If you want a thicker dress, add more than two layers of tea bags. Allow the tea bags to dry. Now you will have one single sheet of tea bags. Carefully, separate the sheet from the nonstick paper. Do this slowly, so that you don’t risk ripping the sheet. The bottom side of the sheet will be very smooth, yet you’ll still make out the tiny tea leaves granules, which look awesome. The other side will have a rough texture. Draw out a dress shape, or download a pattern from the internet. Fold the sheet in half. Using tracing paper, trace the dress on the tea bag sheet on the smooth side. Cut out the dress. Spray the dress with the Fireworks! Shimmery Craft Spray in Lady Bug on the smooth side. Stamp images on your dresses using a variety of StazOn inks. Glue the seams together with the On Point Glue. In order to give the dress dimension, strengthen the paper with Clear Creative Medium. Add saran wrap to inside to give the dress volume and brush on Creative Medium. Create a hanger for the dress. Measure desired hanger size against the dress. Bend the two ends of the wire at about 45 degrees. On one end, bend the wire to 90 degrees, wrap the other end around it, and bend the wire into a hook shape. Hang your dress on the hanger. We are Excited to be Hopping with Crackerbox + Suzy Stamps Today! Today we are blog hopping with Crackerbox + Suzy Stamps! We love blog hops because they are a super fun way for you to learn more about the individual blogs of design team members and it is also a great way to win some new products! 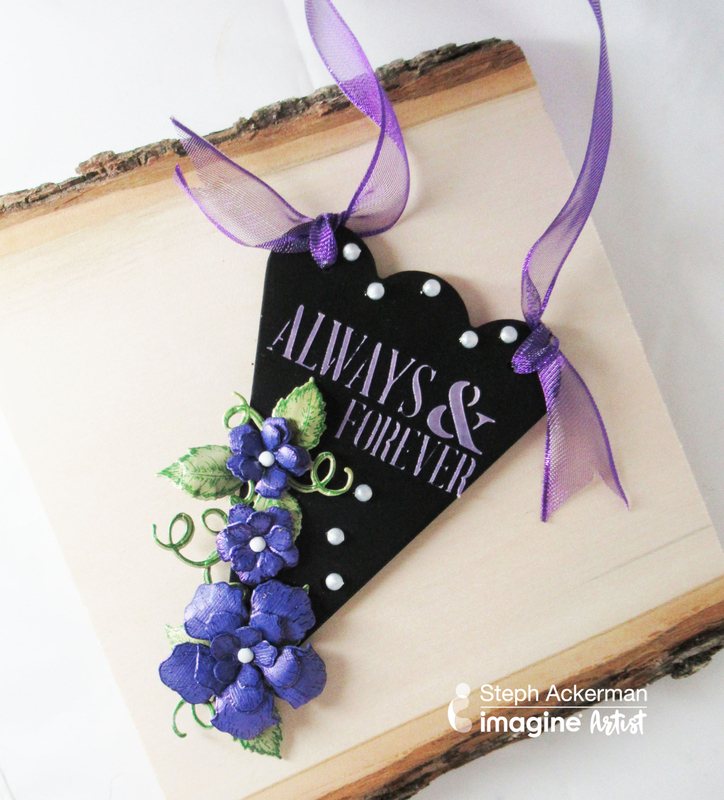 In today’s blog hop, pairing our inks with Crackerbox + Suzy Stamps makes for a perfect match! Crackerbox + Suzy Stamps has fun stamps sets for all sorts of occasions and as you know—we have all sorts of inks for all sorts of projects. Our Artists in Residence have been excited to share their projects with you, and we can hardly wait to see what the Crackerbox + Suzy Stamps Team came up with too! Thanks so much for stopping and be sure to leave comments (one per blog) during these two days of hopping so you can be entered to win a $25 Crackerbox + Suzy Stamps Gift Certificate or one $25 Gift Certificate from Imagine!!! Winners will be announced on the Crackerbox + Suzy Stamps and Imagine Blogs on Friday, October 26th, 2018. Subscribe to the Imagine Blog! Learn more about Crackerbox + Suzy Stamps! It’s never too early to start preparing for the holidays to help avoid the rush. Today I have a fun and easy upcycled project for the little ones in your life – a Toilet Paper Roll Advent Calendar. Now I just have to save up 20 more toilet paper rolls! Buy or collect 25 paper rolls for the 25 days of the advent calendar. Bend the ends of each roll towards the center to make a “pillow box”. Spritz the rolls with Lady Bug, Bamboo Leaves and Wedding Dress irRESISTible Texture Spray. Let dry before moving on to another color. Dye rayon seam binding with All-Purpose Ink in Spring Green and Red Delicious. Stamp white cardstock with a variety of Christmas-theme images using VersaMagic inks. Die-cut circles from the stamped cardstock. Stamp a large number stamp in the center of each circle using VersaFine Clair ink. Sprinkle the circles with clear embossing powder, shake off excess and set with a heat tool. Die-cut scallop circles from Rinea Foiled Papers. Fill and assemble each pillow box with a treat; affix the ribbon around the box using Tear It! Tape and top it off with the number. Ceramic, glass or specially made mat like Polyform’s Sculpey Make ‘n Bake Mat surfaces work best when working with clay. Before starting, determine bowl size. Use a template or a real bowl as a guide. This will help to determine how much clay you will need. For this bowl, use the Canary Sculpey Souffle clay. Begin by conditioning the clay with a clay roller, or pasta machine. When first taking the clay out of the package, roll the clay a few times in order to soften it. If it cracks when running it through the pasta machine or roller; this means that it’s not conditioned. So continue to condition. If using a pasta machine, roll out two sheets of clay to the third thickest setting. If using a roller, aim for ~¼ inch thickness. Ensure that the sheet is big enough for desired bowl size. Place one sheet over the other sheet, roll the clay roller over the sheets; this allows them to stick together and avoids bubbles. Place a long string in a random fashion on top of the clay. Squish the string with an acrylic block or tile. Avoid using your fingers to push in the string, as you’ll get fingerprints and finger indentations on the clay. Pounce the Purple Hydrangea VersaMagic Dew Drop ink. Place a bowl or template over the clay, cut the excess clay. Smooth out the outer edge (or what will be the bowl’s rim) with your fingers or clay tool. Color the outer edge with the Purple Hydrangea VersaMagic Dew Drop ink. Place the clay bowl into a real bowl and bake according to the manufacturer’s instructions on the package. The clay bowl will take on the shape of the real bowl. Seal the clay bowl with Polyform Sculpey Gloss Glaze. Following the same instructions in Step 2 above. Determine bowl size. For this bowl blend 2/3 Sea Glass Sculpey Souffle clay and 1/3 Igloo Sculpey Souffle, to lighten it up a little. Roll out one sheet to the third thickest setting or ~1/16 inch if using a clay roller. 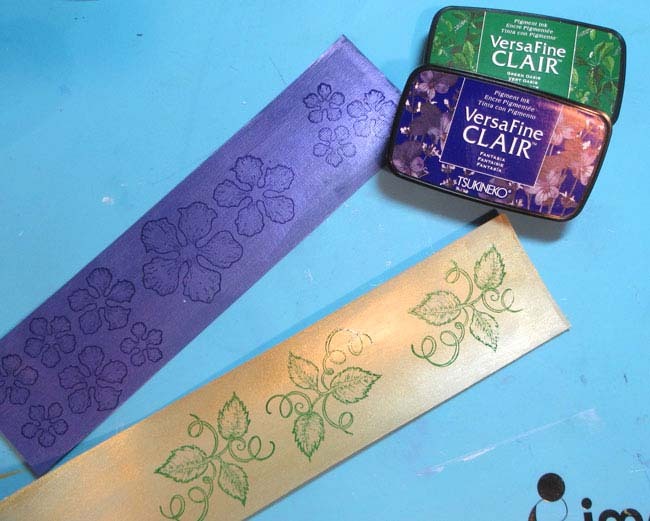 Ink a large background stamp or clay texture stamp with Claret StazOn ink. Stamp into the clay. Press firmly with your fingers. Cut out holes with a cutter or use the cap of a pen. Following the same instructions in Step 2. Roll out one sheet of the Cherry Pie Sculpey Souffle clay to the third thickest setting or ~1/16 inch if using a clay roller. Place the Cherry Pie clay sheet under the Sea Glass sheet. Roll the clay roller over the sheets; this allows them to stick together and avoids bubbles. Cut the excess clay. Place the clay bowl into a real bowl and bake according to the manufacturer’s instructions on the package. The clay bowl will take on the shape of the real bowl. Following the same instructions in Step 2. For this bowl use the Igloo Sculpey Souffle clay. Roll out two sheets to the third thickest setting or ~1/4 inch if using a clay roller. Place one sheet over the other sheet, roll the clay roller over the sheets; this allows them to stick together and avoids bubbles. Pounce on the Spanish Olive and Aegean Blue VersaMagic DewDrop inks onto a rubber stamp. Stamp into the clay. Press firmly with your fingers. Add interest to the edges with some markings. For this bowl, I inked a wooden clay tool with the Aegean Blue VersaMagic Dew Drop ink and pressed it onto the edges. For this bowl, I wanted a sort of uneven edges. I placed the clay bowl in a real bowl and lined the sides with aluminum foil, giving it ruffled like shape. Bake according to the manufacturer’s instructions on the package. The clay bowl will take on the shape of the real bowl. Dealing with backs of the bowls. I like to stamp textures or images stamp to backs of them, but not add color. It is very important to seal the bowls. Sculpey’s Gloss Glaze works great for sealing the bowls. Sealing clay projects helps to protect the ink and clay, makes it look lively and purposely finished. As Summer is on its way, it’s time to start thinking about the upcoming wedding season. For this project, I wanted to incorporate Creative Medium acrylic paste so I decided to do some experimenting. The iridescent material in pastes pops on the black chalkboard piece and creates a beautifully vibrant effect. 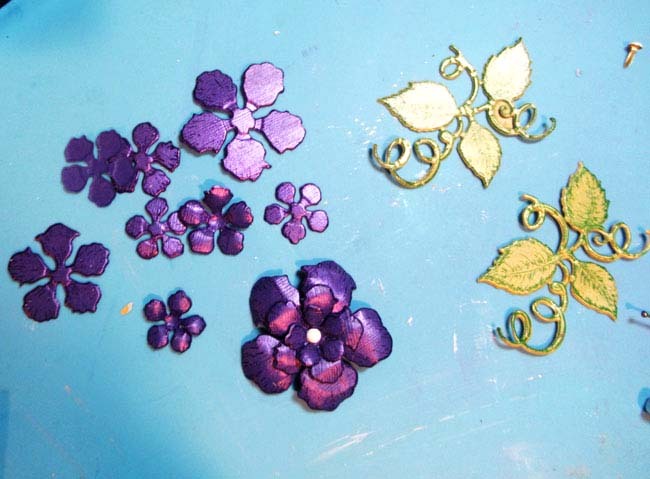 To match all the colors, I also applied the pastes to cardstock to make flowers. 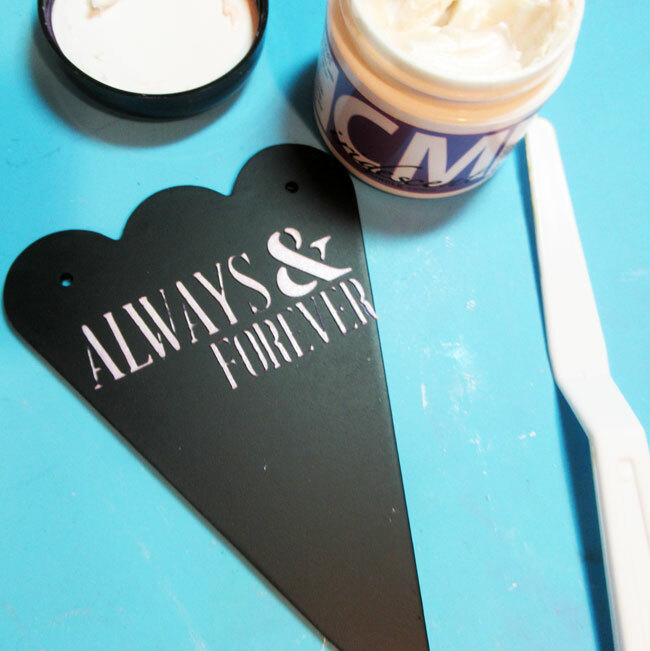 Take a look at how I created a beautiful decorative sign using Creative Medium and VersaFine Clair. Tape the stencil to the chalkboard, covering any parts of the stencil you don’t want to use with extra tape. 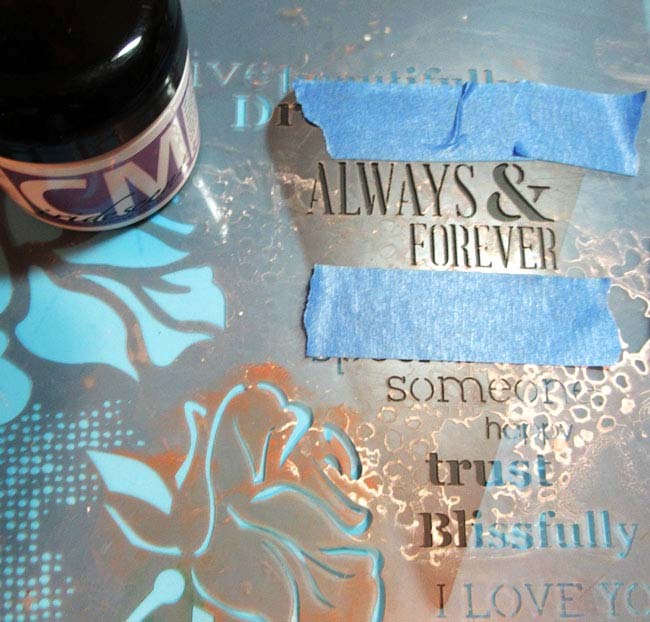 Using a pallet knife, cover the stencil with Creative Medium Purple Iridescent. Remove the stencil and allow the Creative Medium to dry. 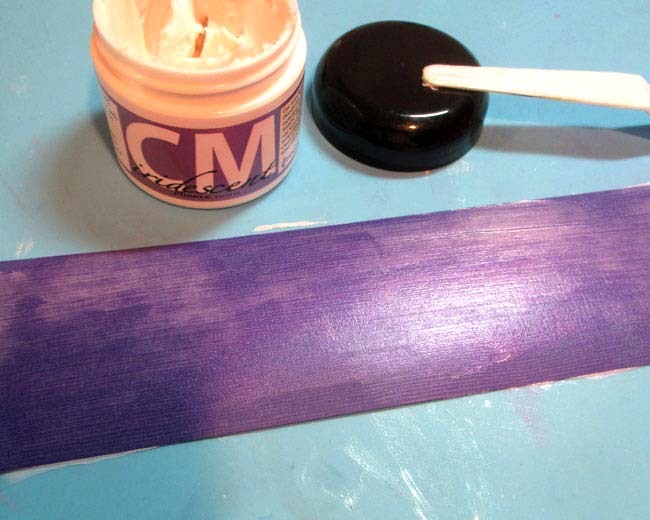 Use a pallet knife to apply Creative Medium Iridescent Purple onto a strip of purple cardstock. Use a pallet knife to apply Creative Medium Metallic Gold onto a strip of green cardstock. Allow both pieces to dry before moving on to next step. Stamp flowers with VersaFine Clair Fantasia Ink on the strip of purple cardstock. Stamp leaves with VersaFine Clair Green Oasis Ink on the strip of gold covered green cardstock. Using the coordinating dies, die cut the flowers and leaves. Assemble the flowers by shaping the petals with a stylus and piecing together with brads. 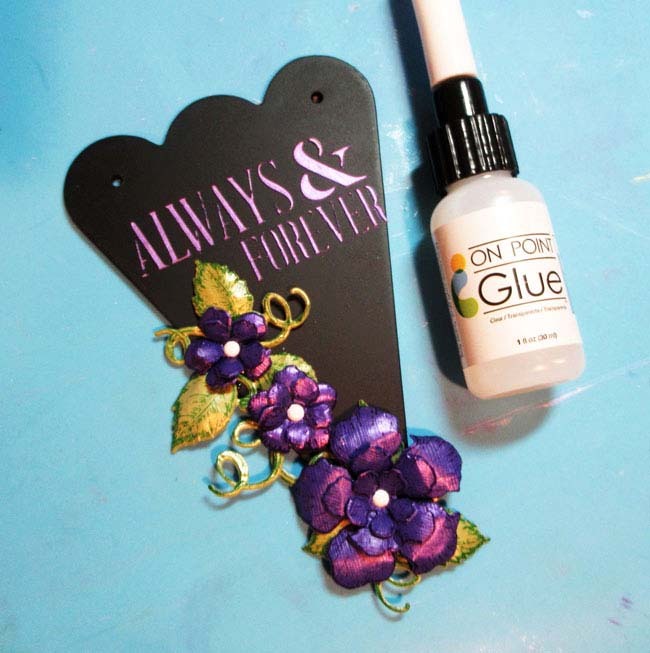 Use On Point Glue to adhere the flowers and leaves to the panel. Tie purple ribbon to the panel. Use On Point Glue to adhere pearls about the panel. This piece would look great hanging on the back of the bride and grooms chairs, near a floral display or by the guest book. It would be easily customized to match the wedding colors of choice as well!